Dies R Us: "Whatcha" Up To? Welcome back! Can you believe Thanksgiving is already behind us & it is December already? I'm getting really in the mood for Christmas now! I put my tree and decorations up after Thanksgiving as Christmas is and always will be my favorite time of the year. I ADORE Christmas! And once I get every room in my house decorated, I'm ready to work on my cards again. 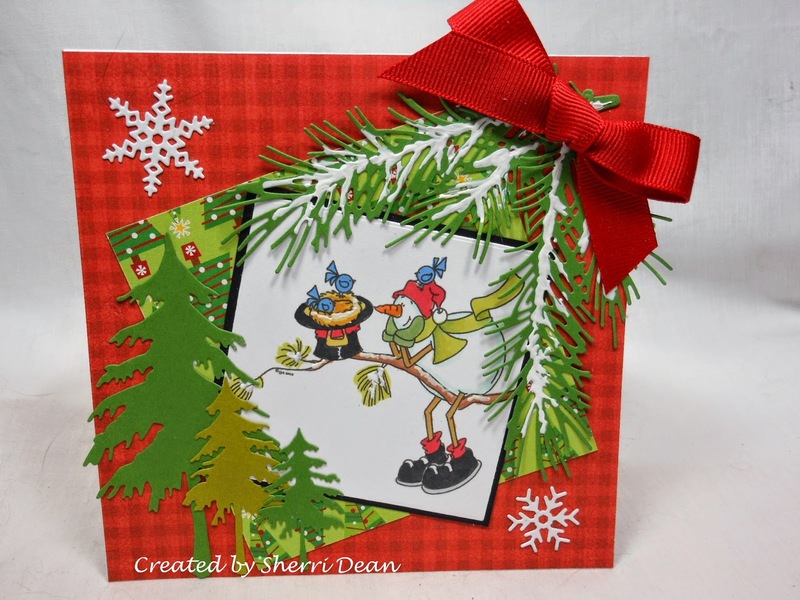 Today's card is made using one of my favorite digi stamps from Sassy Cheryl. I love this friendly little snowman sitting in the tree visiting with his little friends. To complete my card I used the following dies: Impression Obsession Pine Branch, Impression Obsession Small Snowflakes & Impression Obsession Fir Trees. I LOVE this Impression Obsession Pine Branch for Christmas cards! Add a little snow or glitter to it & it looks like the real thing! We just started another challenge on Monday on our Dies R Us Challenge Blog too, so head on over there to join in for a chance to win a gift voucher! And don't forget to clue "Santa" in to the fact that Dies R Us also has gift certificates! Don't forget to check out the wonderful inspirations from our great Dies R Us Design Team! Half of my wish list is created once I check them out! lol It always helps to see someone else's version of a die. I'll be back again next Wednesday. Until then, have fun creating something wonderful!